I am sure you’ve seen all the posts about preparing your new school-ager for the first day of kindergarten. Those tips have been a great help. I remember the thoughts that ran through my head that last first day of kindergarten with my youngest. She still can’t tie her shoes though. Since she doesn’t own any shoes with shoelaces, we’re going to worry about that on another day. Let’s talk about you…the mom. Dropping your child off for the first day of kindergarten is one of those “big deals” in motherhood. Your baby is entering a new phase and you won’t be there to help her. There may be tears again this year. My tears. I am not ashamed to say that a few tears trickled down my cheek as I drove away and left Pork Chop at “big kids school” last year. When my oldest started kindergarten, I was an anxious mess. He had about 10 minutes of anxiety the night before the first day of school. I had a 10 hour panic attack. I cried through rush hour traffic all the way to work. He was going to a school where I didn’t know all the teachers, the routines, or the other kids. My kids attended the same daycare from the time they were 8 weeks old until they moved to kindergarten. Their pre-kindergarten teachers were the same women who had changed their diapers as infants. They had moved up from the baby room to preschool, and by the time my kids got to voluntary pre-kindergarten their favorite teachers were certified to teach voluntary pre-kindergarten. I was no longer in my element when it came to the place they would spend a large chunk of their day. But I didn’t show the nerves to anyone outside of my friends and family members. Because Pork Chop needed me to be okay. He needed to see me go with the flow and embrace this change in our longtime routine. He went from being the “big man on campus” at his preschool/daycare to being a little kindergartner surrounded by all the “–graders.” His backpack was nearly as big as he was. 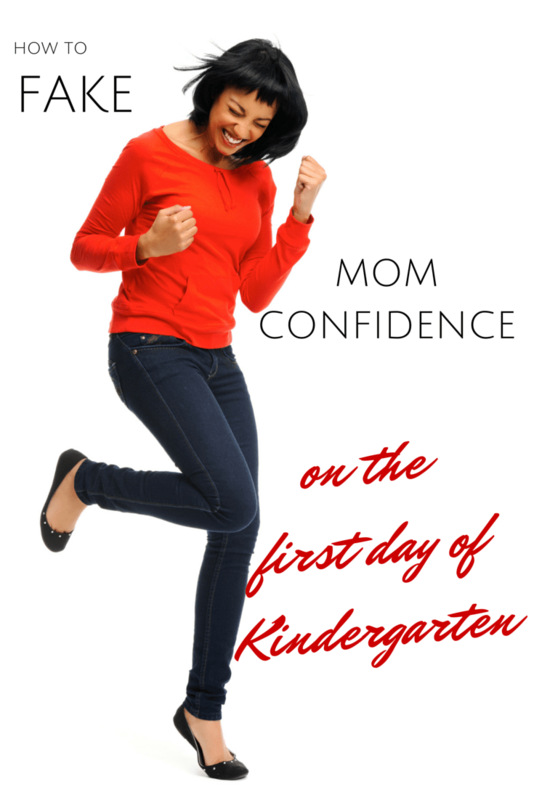 So in honor of my first “back” to school and my second first day of kindergarten, here are a few tips so that you can fake mom confidence like a rock star on the first day of kindergarten. Wear something that makes you feel both comfortable and presentable. Those heels may make your legs look stunning, but with all the parents dropping off their kids at school on the first day, you may not be able to find a nearby parking spot. Those killer legs may start to scream at you with every step. Make eye contact with other parents. Some of those parents have older children so seem like old pros but there will be others who are just as anxious as you. Introduce yourself and your kindergartner to another parent and child. This will help your child feel more comfortable because now she will know someone in their class. And once you say your goodbyes and walk back to you car…. 2. It took me so long to write this post. I have been thinking of it since my son started kindergarten last year but I kept getting distracted 🙂 My son is going into first grade and he still forgets to raise his hand. Besides Pea is tricky, she knows she is supposed to raise her hand but whether or not she decides she wants to raise it instead of yell out is another question! My eldest will be starting kindergarten in a few weeks. I’m honestly less worried about me than I am about him! I’m a little (okay, a LOT,) afraid that I haven’t prepared him enough! It helps to be reminded that there are very likely other parents feeling the same way! Exactly Cristi! I felt so out of my element when my oldest started last year. It turned out that he was way more prepared to deal with the transition than I was. Kids make friends much more easily than adults and they are already used to taking direction. There are bumps in the road but kindergarten is where they become acclimated to the school routine. What a great post! I’ve seen so many posts that focus on the kids going off to school, and forget that it is a big deal for you, the parent, as well. Good job! Thanks, Samantha. Even though it’s my second go around, I still feel the butterflies and the worry. My daughter hugged me today and told me that she was sorry I was going to have to be alone everyday and that she would spend time with me after school. It broke my heart! It’s always nice to teach your kids the things they’ll learn in Kindergarten ahead of time, to have them prepared. I don’t have kids but great tips. I’m sure mom’s being confident then makes the child not as nervous too. I think I have mastered it! I’ve had 14yrs experience sending my kiddos to school! When I worked outside of the home my oldest was in daycare and It killed me more than him! There were times I cried the entire way to work because I didn’t want to be away from him. I’m sure most kindergarten teachers are used to helping mom’s through this tough test, so knowing that they’ve had years of experience taking the reins should help relieve some of the worries. Deep breaths always help me calm down as well. LOL. I mean, literally, LOL. This is a great post. I have a 14 year old son, so I’ve had my share of school firsts. Don’t worry, it’s not as terrifying as it sounds. Those are some awesome tips! My daughter is 2 and I am dreading the day that she goes to preschool. As a father of three here’s some advice: STOP WORRYING! Your daughter will do just fine. Fake it till you make it! Faking confidence and happiness, I fee, can make you happier and confident in the long run because it keeps you positive! I was so proud today! Neither of us cried. She looked pretty close but kept it together! It’s great that kids nowadays know how to operate a mobile phone and telephone so they can just call their parents when they need help. Your daughter is very smart! Great tips. Kindergarten is such a milestone. Can be hard on the parents to see how grown up their baby is. You played the role perfect mom. If you are nervous or anything like the the child will be too. Great job and thanks for sharing with others moms. This is such a great post! Parents think about all the stuff their kids need at school but what they need the most is to see that you are confident that they are going to have a great experience. If you’re stressed they will definitely pick up on that. It has been many years since my days of Kindergarten. I still remember how hard it was to let them go. I remember being relaxed on my daughter’s first day of school. I know that If I show anxiety she will pick it up from me. I love how you have “smile” listed to many times. You may want to cry, but it’s a happy day! Your little one is growing up! I didn’t get to drop my daughter off at Kindergarten (I had to work) and I really wish I would have been able to. I am looking forward to dropping my boys off at Kindergarten, but that’s still a few years away! Risa recently posted…Breastfeeding Mothers: Respect One Another! How amazing. You are stronger than you even know and so is your daughter. Thanks for sharing the rock star tips. I had the confidence that i needed during the first day of school. My son is also in Kindergarten and it’s fun seeing him participate in class. So true. Smile, smile then smile. 😉 I can’t believe in a couple of years I will be sending my youngest to kindergarten. I remember how sad I was to let my kids go to school. There are so many hours in the day that you just have no idea what’s going on and that’s a huge change. I get it! michael recently posted…Sometimes kindness is not always seen…. I sent my kiddo to kindergarten last week for the first time. Luckily I am a teacher right across the hall so it made it a little easier! very nice to hear but can you imagine how i felt before when my daughter ride the school bus first day of school kindergarten? like I dont know i am so crazy just thinking about it that she will be crying just by herself in the schoolbus going to her clasroom that she didn’t know nayone else hahaha but she went home happy and fun she loves it She so brave. I haven’t seen kids did like what she did on her first day. First day of kindergarten I sat in my car and cried for longer than I care to admit. Thank you for providing me with an alternative route for when I send off my littlest to school! I was so proud of myself for not crying! Great post!! My oldest took to kindergarten like a champ…while I bawled at home. My second had to be peeled off of me for two months and bawled at school while I bawled at home. But, I never let them see me sweat!! Hopefully my 3rd will be so enamored by all that is “big kid” school by the time he gets there that he will just drive himself 🙂 Thanks for sharing! I bawled with my oldest but though it was close, I held back the tears this time. Second child syndrome! This helps since I’ve been thinking about putting my three year old in day care soon. I’m sure I’ll cry more than he does! Mine started daycare at 8 weeks and I cried and cried. I know that feeling. It went away though when I realized how much they loved it. My daughter would cry like the world was ending and then as soon as I was out of sight she would stop and play. The director had me sneak a look into the window to prove to me that my daughter was fine the minute I walked out the door. Haha I absolutely loved this post! While I don’t have children yet, I’m sure I’ll be sobbing like a baby when my children go to school for the first time! I remember when i went for first day in my very beginning school cry and asking i don’t want to go… but then i went. My girls aren’t entering kindergarten this year, but these are some great tips. Relax mom and smile. Love it. And love the new site design. 🙂 Thanks for linking up with HDYDI Herchel! Thanks Katelyn! Are they entering preschool or are you still deciding? Yep. Both mine went this year and it was difficult, but so good! They are loving school and it is another milestone. Love the tips!! Happy SITS!